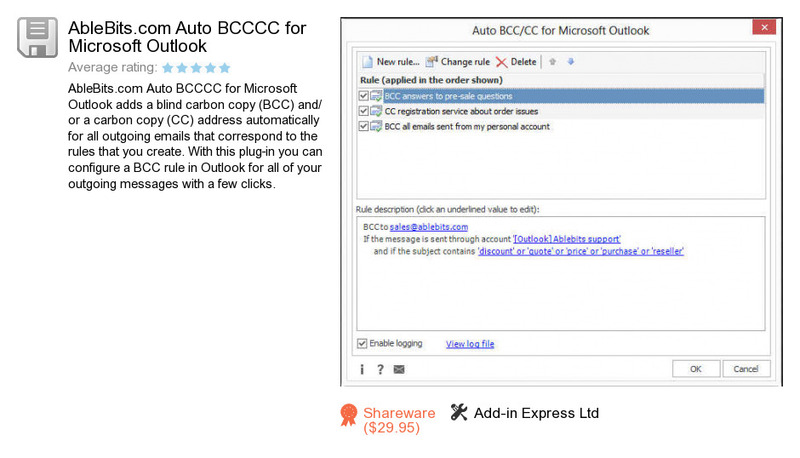 AbleBits.com Auto BCCCC for Microsoft Outlook is a program developed by Add-in Express Ltd. We know of versions 4.1, 4.0, 3.5. Version 4.1.9 is available for download at our site. AbleBits.com Auto BCCCC for Microsoft Outlook package has a size of 15,497,642 bytes. Add-in Express Ltd also publishes Add-in Express Excel Toys for VSTO (C#) and EventsLogger.